3-D video gaming is coming, but at what cost? After the success of 3-D movies, game designers and manufacturers are hoping to strike gold with 3-D gaming. (CNN) -- After the rush by audiences to Hollywood 3-D blockbusters "Avatar" and "Alice in Wonderland," game designers and developers are hoping to strike gold with 3-D gaming. Today's best games, already immersive experiences thanks to large-screen TVs and sophisticated graphics, could become even more intense in three dimensions -- imagine "God of War III" in full, bloody 3-D glory. So far, however, the video gaming industry has proceeded cautiously. The big three console makers are taking different routes to 3-D. Sony has already pushed out software changes to allow games in 3-D on its PlayStation 3 system. Microsoft said it also can do 3-D on the Xbox 360 but prefers to wait, while Nintendo, maker of the Wii, is going small with its 3-D gaming plans. Panasonic and Samsung recently introduced home 3-D television systems, and Sony is prepared to issue its own 3-D TV models next month. Other TV manufacturers are close behind. Computer manufacturers also are making the technical adjustments to show games in three dimensions, but those changes will come with a significant price -- and with many questions. Digital graphics maker NVIDIA has developed technology that renders an image twice on computer monitors and requires shuttered eyeglasses to produce it in 3-D inside the user's brain. Phil Eisler, an NVIDIA general manager, said the company is taking advantage of work already done by gaming developers. "They do all the work to make games in 3-D, but then render them flat," he said. "We can portray the games the way they should be." Gaming software for 3-D play shows the action from two slightly different angles. The active-shutter glasses alternately open and close to give the eyes different views and allow the brain to put the images together in what appears to be three dimensions. Eisler said the glasses refresh at a rate of 60 hertz for each eye, with a scroll wheel that allows the user to adjust the depth of vision for the game. "It is like hyper-stereo," he said. "For first-person shooter games, this kind of depth could be invaluable." Patrick Bach, senior producer at game developer DICE, said whether it is this technology or another, gaming is headed for 3-D soon. DICE and its owner, Electronic Arts, will be upgrading their new game, "Battlefield: Bad Company 2," into a 3-D game with a patch. "Special hardware will be a hurdle. But we want people to experience the game in 3-D," Bach said. "We wouldn't add this if it didn't add to the game." Eisler said developers don't have to do anything extra to make their games work in three dimensions. The "NVIDIA 3D Vision" process automatically transforms nearly 400 PC games into full stereoscopic 3-D right out of the box, without the need for special game patches, he said. But he said many companies are going the extra step to make their titles look better in 3-D by adding such enhancements as out-of-screen effects and showing in-game movies and backgrounds in 3-D.
"In 'Bad Company 2', for example, they have rendered all their cut scenes in 3-D as well," Eisler said. "They have done a stellar job with their game." While games might be ready for 3-D, gaming hardware likely is not. And upgrades aren't cheap. To display 3-D images, computer monitors will need to refresh at a rate of 120 hertz, slightly higher than current models. Several manufacturers are producing 3-D-ready monitors in high definition and non-high def, but those can cost $500 to $600. Eisler said a mid- to high-end video card (from $150 to $300) also will be needed to handle the extra rendering load. And don't forget the shutter glasses that connect to the computer via an infrared beam (an extra $200). Of course, gaming in three dimensions won't be limited to the computer. Sony announced that a software upgrade will be pushed out to its PlayStation 3 consoles to allow for 3-D action using 3-D-ready televisions. The console already has the necessary processor and connection capabilities to show games in 3-D, and all PS3s sold since 2006 will support the upgrade. But no 3-D games were available for the PS3 system at the time of the software release. What that means is even if you have all the hardware (3-D TV, shutter glasses) and software to play games in 3-D, the game must also be designed to be played in 3-D for the effects to show up. These 3-D ready games are expected before the end of 2010. Nintendo is expected to unveil its newest handheld console, the Nintendo 3DS, at the E3 gaming convention in mid-June. 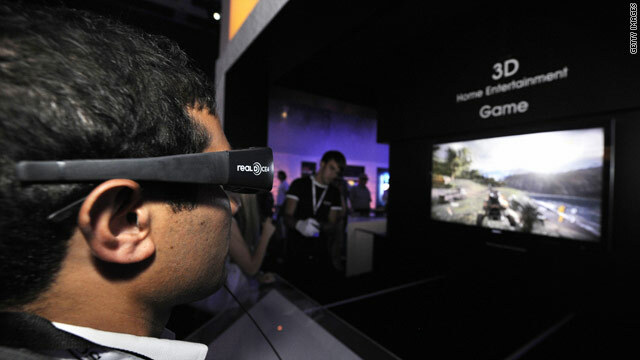 The company said the portable device will produce 3-D effects without the need for any special glasses. Microsoft has not announced any plans for 3-D gaming, choosing to focus instead on its upcoming system, code-named Project Natal, which will allow players to control their in-game avatars by moving their arms and legs. The Project Natal system is expected to hit the market by the end of the year. Microsoft said its Xbox 360 is 3-D-ready but has questioned gamers' level of interest in 3-D and would prefer to wait and see how the new technology will be received. For example, it's not clear whether gamers or TV watchers will want to spend long hours staring at screens through shutter glasses. Some moviegoers who wore the glasses during 3-D screenings of "Avatar" reported suffering dizziness, headaches and nausea. The shutter glasses' technology is so new that researchers have not done studies on the effects of watching screens for long periods. Can 3-D movies, TV make you sick? Samsung recently issued a statement warning kids under 6, pregnant women, the elderly and anyone who is sleep deprived or under the influence of alcohol from watching 3-D, which the company said could cause headaches and eye fatigue. The statement also recommended that viewers take frequent breaks -- a drawback for hard-core gamers. iReport: Do health warnings about watching 3-D concern you? Tell us. Does 3-D gaming have a future? Gamers so far are taking a wait-and-see approach to 3-D technology for gaming. The expected high costs are keeping some away, while limitations on gameplay have others concerned, according to the chatter on gaming-site message boards. "The idea sounds cool, but I'm not sure it's enough to spend another thousand dollars on a nice '3D compatible' TV," wrote a user named joeborg14 on Gamespot. "Not to mention wearing those gorgeous glasses. And what about split screen? That's gonna throw a wrench in the whole deal." As more games and movies are shown in 3-D, as 3-D TVs begin to appear in homes and as costs come down, 3-D gaming may eventually go mainstream. And as technology continues to improve, people may even be able to experience 3-D entertainment in their homes without special glasses. But the real measuring stick for the video game industry will be the quality of the 3-D gaming experience itself, and whether consumers feel like games in three dimensions are worth the time and expense. Otherwise, 3-D equipment may fade into obscurity as quickly as the Atari Jaguar console did in the 1990s.